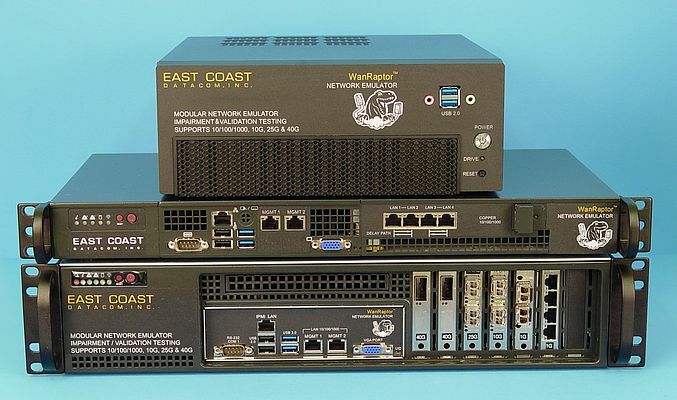 WanRaptor™ is network emulator launched by East Coast Datacom, American producer of network latency emulators. With the purchase of the WanRaptor™, users gain instant access to network latency testing for 1/10/25 & 40GbE in one COTS hardware platform. This new high-performance network latency emulator supports data rates from 300bps to 40GbE. It supports line rate packet throughput performance with latency accuracy within 50 microseconds. WanRaptor™ has an easy to use Graphical User Interface (GUI) supporting impairments for latency, bandwidth, loss and re-ordering. Additional features include changes-on-the-fly to speed test configurations and four optional latency type selections such as inter-packet-delay for testing streaming video. It is available in three chassis types: desk Top/Portable: Single, 2-Port or 4-Port NIC Card; 1U Rackmount: Two, 2-Port or 4-Port NIC cards; 2U Rackmount: Supports Multiple NIC Cards up to 12-Ports.